Trump won all 57 delegates in Indiana. This was the last stand of the anti-Trumps. Cruz announced he was dropping out shortly after the state was called for Trump. Kasich is still in it, but hasn’t shown any delegate gathering ability that would indicate he could make a difference. Even with a loss in Indiana, Trump would almost certainly have won in the end. That has been clear for a couple weeks now. But he didn’t lose Indiana, he shut everyone else out completely. 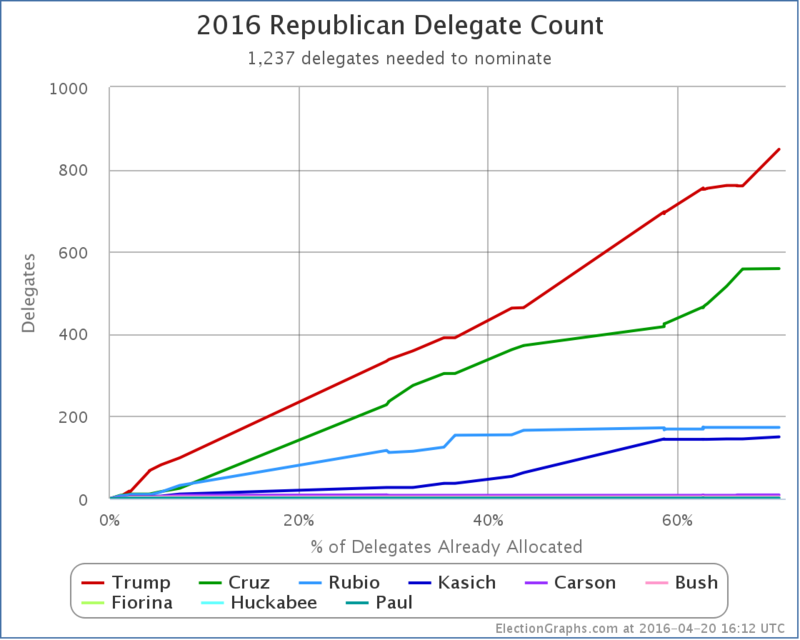 Trump hasn’t wrapped things up quite yet, he still has to collect a few more delegates. But something unexpected and dramatic would have to happen to stop him from getting there. The Republican race is now in the same state as the Democratic race has been for awhile. The outcome is known, and we’re just watching the winner mop up the last few delegates they need. Trump 1058, Cruz 574, Rubio 173, Kasich 156, Carson 7, Bush 4, Fiorina 1, Huckabee 1, Paul 1. This means Trump now needs 179 of the remaining 497 delegates to wrap this up. 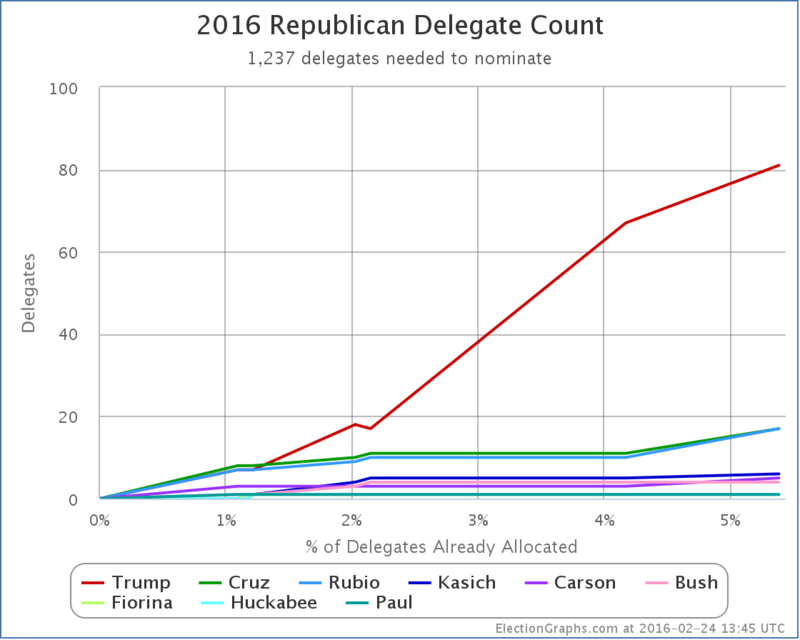 Trump now needs 36.02% of the remaining delegates to get to the magic number of 1237. The remaining contests are essentially now just Trump vs Kasich. Unless you believe Kasich is suddenly going to start winning delegates in every remaining state by 64% to 36% margins despite getting less than 8% of the delegates so far, Trump will do what he needs to do. He will probably do much better than he needs to do. So he will win, and he will win outright. No contested convention, just an outright win. And so we’re essentially done. ElectionGraphs.com will continue to document this process, but now it is just a matter of watching Trump gather up the remaining delegates needed. There is no question any more how this will play out. Unless a metaphorical meteor (or a literal one I guess) hits Clinton or Trump, we have our nominees. The general election is lined up. We are going to be watching Clinton vs Trump. Update 2016-05-11 06:32 UTC – Adjustments from American Samoa’s uncommitted delegates, and Louisiana’s uncommitted delegates as well as Louisiana’s now free Rubio delegates. Net result: Trump +14, Cruz -3, Rubio -5. Trump won New York 90 to 5. Those 5 delegates went to Kasich. If there was any surprise here, it was that Trump got a few more delegates than expected. I didn’t track it in detail, but my impression was that most people expected a result in the 80’s. In addition, since Wyoming there was an update to the delegate count in Georgia that moved one delegate from Trump to Cruz. So the net change since Wyoming was Trump +89, Kasich+5, Cruz +1. So Trump got 93.68% of the delegates since Wyoming. He only needed 58.17% of the delegates. He easily cruised past this bar. So where does this put things? 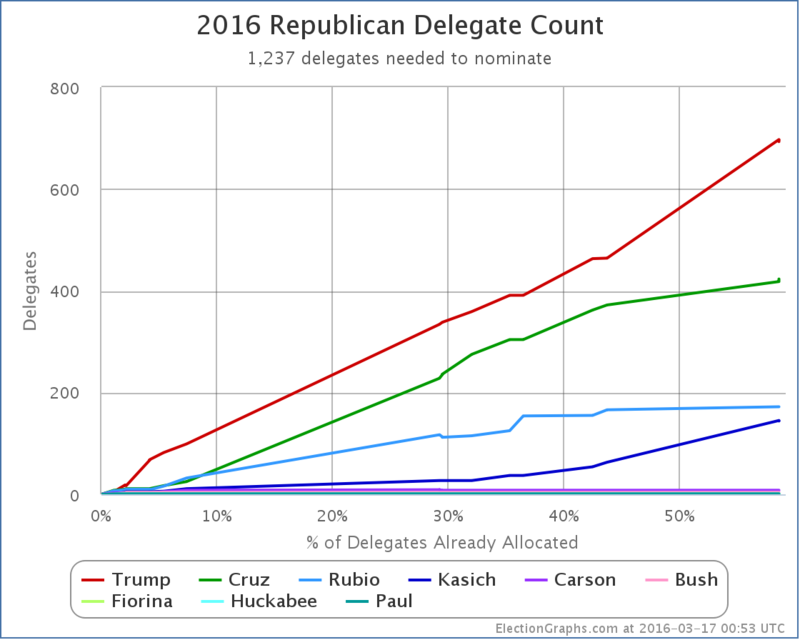 In raw delegates we now have Trump 849, Cruz 559, Rubio 173, Kasich 150, Carson 9, Bush 4, Fiorina 1, Huckabee 1, Paul 1. We have 725 delegates still outstanding or uncommitted. 1237 delegates are needed to win. In percentage terms Trump now has 48.60% of the delegates determined so far. He is very very close to the magical 50% mark, but not quite there. 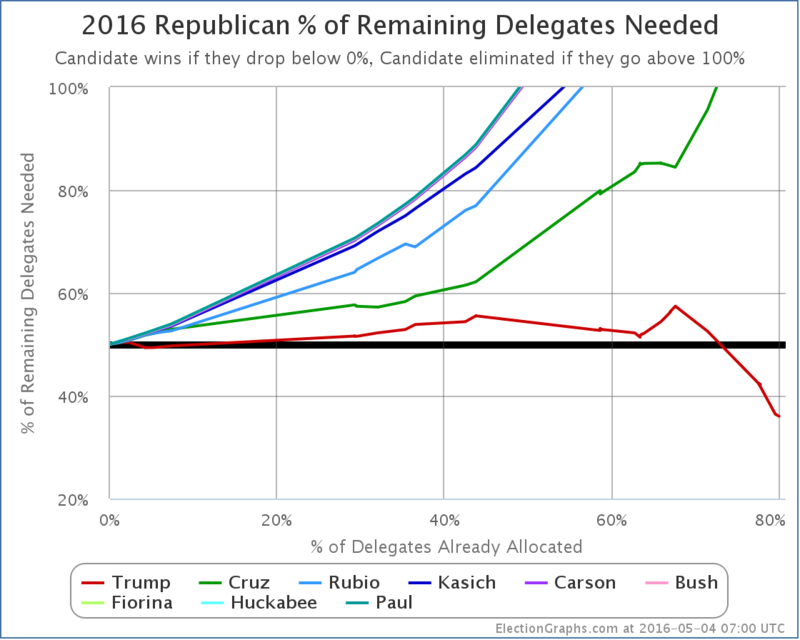 So time to look at the all important “% of remaining delegates needed” graph. As mentioned in the post here about Wyoming: If Trump did as well as was expected, he would undo most, but not all, of the damage done by Cruz’s recent series of wins, and that is exactly what played out. 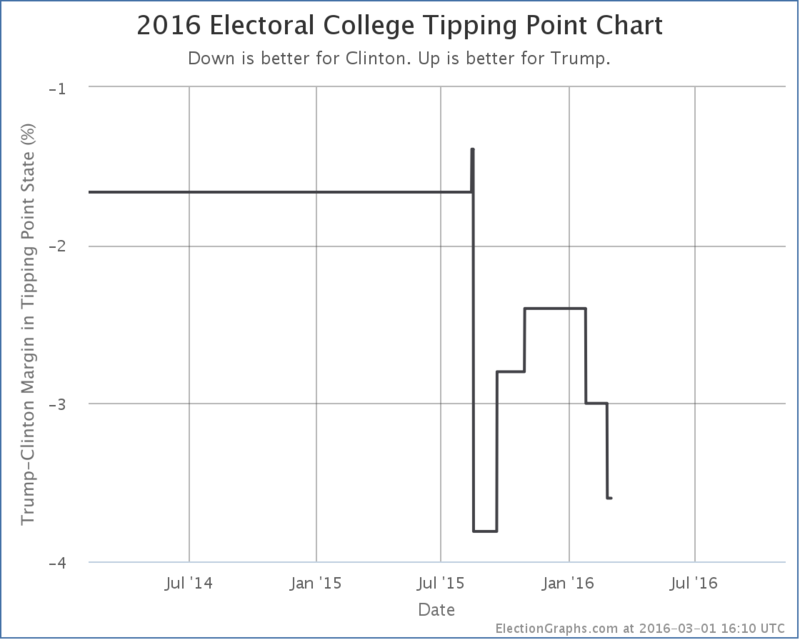 Trump was down to 52.22% before his series of losses. After those losses he was up to 58.17%. Now he is back down to 53.52%. 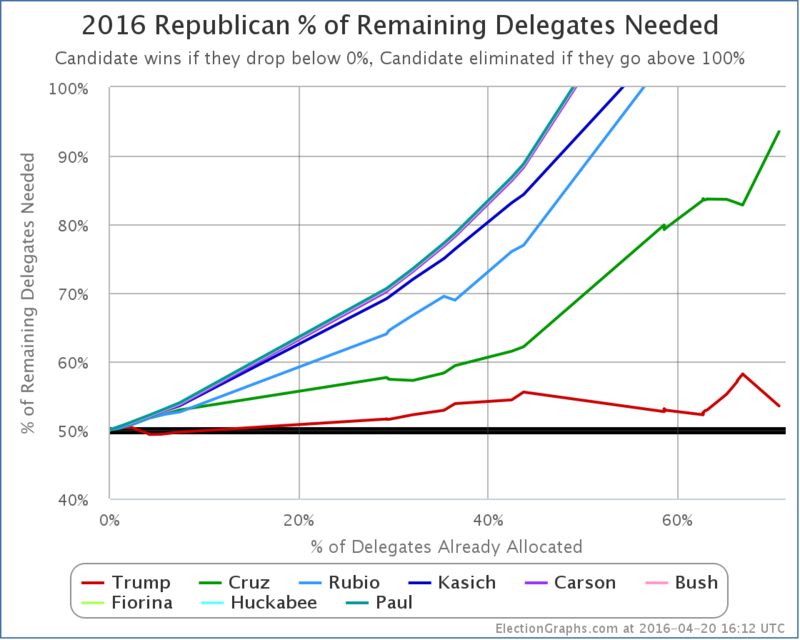 Trump needs to get at least 53.52% of the remaining delegates… including officially uncommitted delegates… to get to 1237 and win this thing outright. Even one delegate short of that, and we’re in the multi-ballot convention zone. The next few states are all very favorable for Trump. Next Tuesday we have Pennsylvania, Maryland, Connecticut, Rhode Island, and Delaware. 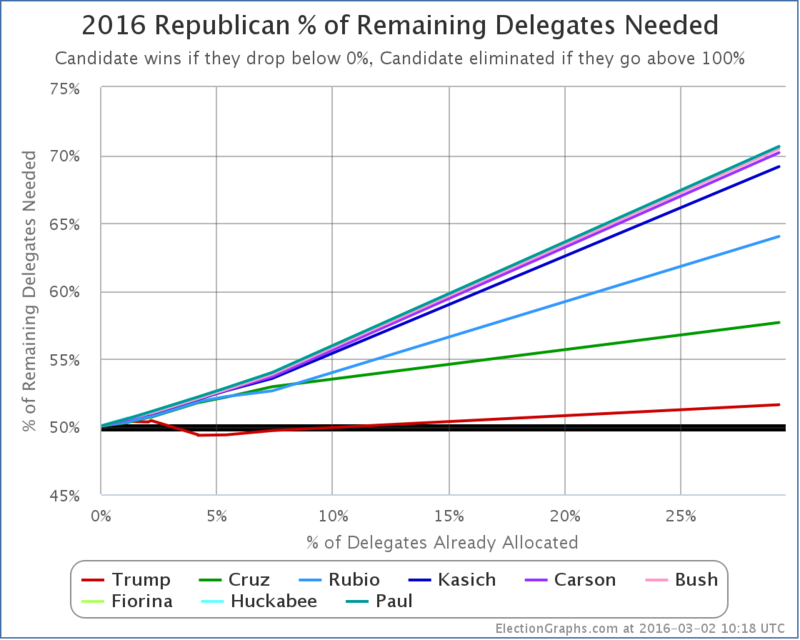 Trump is expected to win all of them, by significant delegate margins. 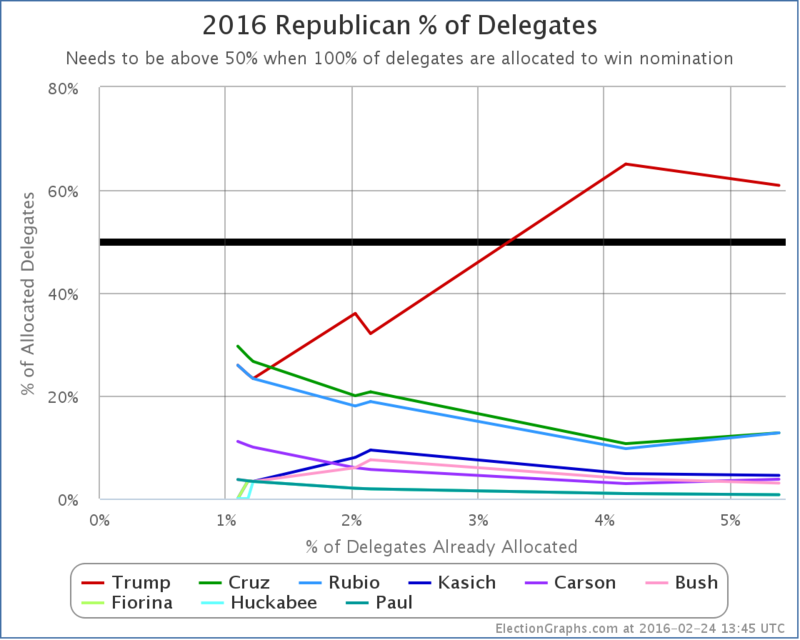 It is very possible that he will be over 50% of the delegates allocated so far at that point. But then he has to keep it. Trump will still be right on the edge. He does a little worse, we have a multi-ballot convention, he does a little better, he wins on the first ballot. So what are Trump’s odds of getting to 1237? This is unclear. But what is clear is that we are not yet at the point where we can say that either the path to an outright Trump win, or the path to a multi-ballot convention is undeniably the likeliest outcome. Trump can still get an outright majority of delegates. This is very plausible. It is a reasonable possibility, not just a fantasy. Looking at the simulators at The Upshot and FiveThirtyEight you see that it is still very easy to get Trump to the magic number. You usually have to use uncommitted delegates though. Trump will need to convince some more of them to come his way. So maybe Trump is at 30% to win outright, or maybe he is at 64%. Either way, these are odds where either outcome would not be surprising. We’re basically still in the tossup zone. We are STILL right on the edge between Trump and a multi-ballot convention. And we might stay right on that edge straight through the end of the primaries and caucuses in June… or even all the way to the convention if the uncommitted delegates don’t start letting us know what their true preferences are. Unlike the Democratic side, where Clinton has just been slowly but surely grinding out a win, here on the Republican side we have real drama. None of the others running can realistically win outright, but they CAN still stop Trump from winning outright and force a contested convention. Cruz got a bit more than my predictions, Rubio a bit less. But basically using the polls a couple days out got things pretty spot on. So minus any big changes from Missouri or minor adjustments elsewhere, this was the expected scenario. 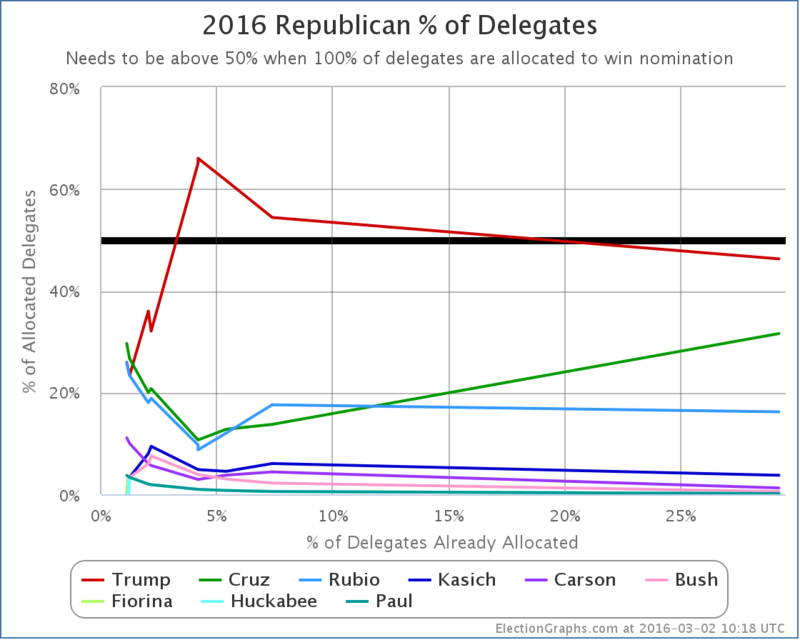 This is the percentage of delegates allocated so far to each candidate. Trump is just BARELY under the 50% mark. Only Trump and Kasich improved on this metric with the March 15th results. Everybody except Trump got further away from the nomination after March 15th. In fact, all of them got a LOT farther from the nomination. In fact, almost all the candidates have now been mathematically eliminated from a first round convention win. We knew for a long time that Paul, Huckabee, Fiorina, Bush and Carson were headed there. But it is now official. But Rubio was also eliminated. And despite his “big win” in Ohio, so was Kasich. 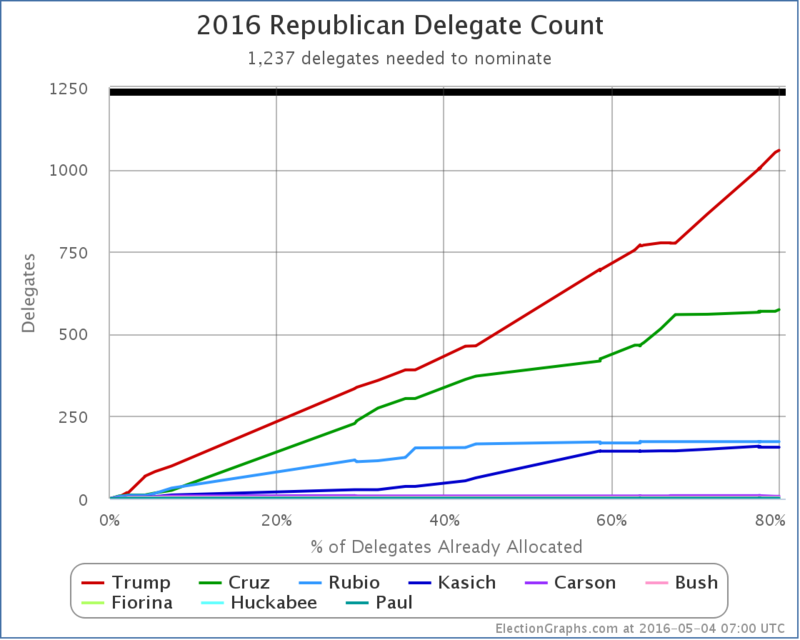 All of these candidates could get every delegate still outstanding… and still not end up with enough delegates to win. 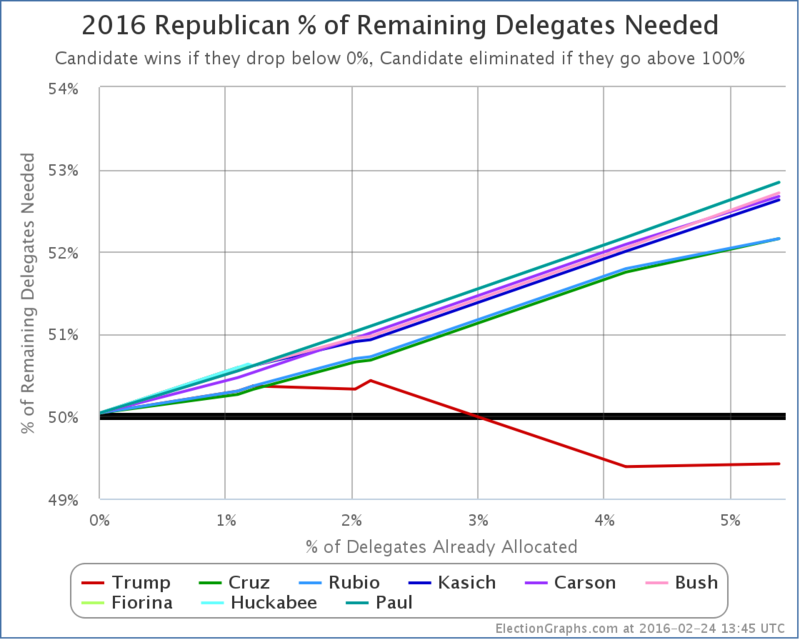 Trump needs 53.07% of the remaining delegates to win outright. Less than that will get us to a contested convention and all kind of chaos. But how likely is Trump to get those sorts of margins? So far of course he has only gotten 47.89% of the delegates. So he does have to improve on his previous performance by about 11%. This sounds like a lot, but it is probably quite reachable. First, Trump will undoubtedly pick up some of Rubio’s supporters, they won’t all go to Cruz and Kasich. Second, there are a number of winner take all states coming up. Third, a lot of the states that are not winner take all are still winner take most. Basically, the structure of the primary calendar is DESIGNED to help the front running candidate wrap things up. It is not unreasonable to think Trump will be able to do that. To stop it, Cruz and Kasich between them need to be getting more than a majority of the delegates despite the fact that neither of them has a realistic shot at an outright win. The only plan for those two is to force the contested convention, then win there. Some places have tried to game out all of the remaining primaries and caucuses, and they conclude that we may in fact not know if we have an outright Trump win or a contested convention until the very last contests on on June 7th. That would be California, Montana, New Jersey, New Mexico and South Dakota. And there is a possibility we won’t even know until after that, because although their numbers are small, some states and territories have actually elected uncommitted delegates, who like superdelegates on the Democratic side are free agents able to vote however they see fit. There is a posisbility (a small one, but non-zero) that these uncommitted delegates may be in a position to determine if there will indeed be a contested convention. I won’t try to game out the rest of the season, but I will look at next Tuesday… Arizona, Utah, and American Samoa. 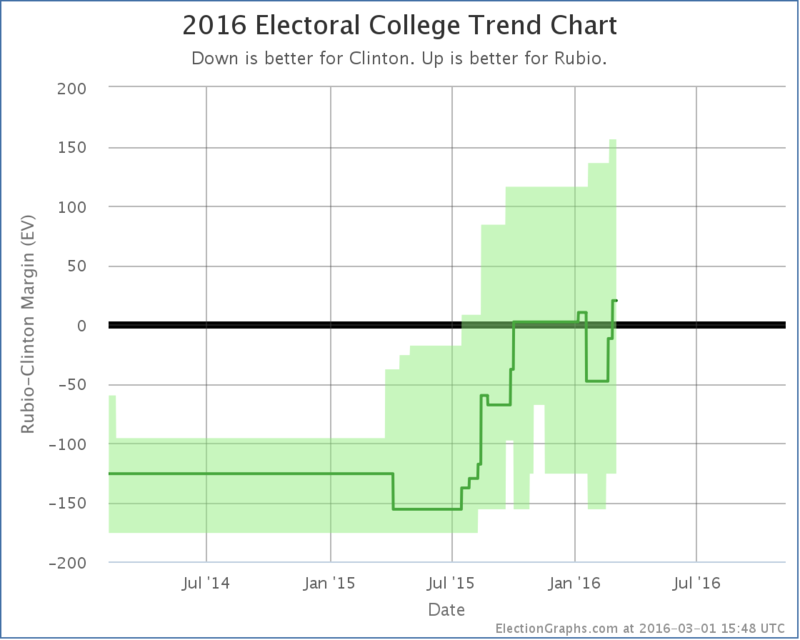 As usual, looking at RCP for polls, and Green Papers for delegate rules. But guess what? As of today, there has been NO recent polling on any of these three. So we’ll use national polling, but eliminating candidates who have dropped out. So Trump 36.0%, Cruz 21.8%, Kasich 12.0%. Normalized to 100%, that is Trump 51.6%, Cruz 31.2%, Kasich 17.2%..
Arizona is winner take all. Unless Cruz or Kasich are doing much better there than nationally, Trump gets all 58 delegates. Utah is winner take most. If anybody gets over 50%, they get all the delegates. 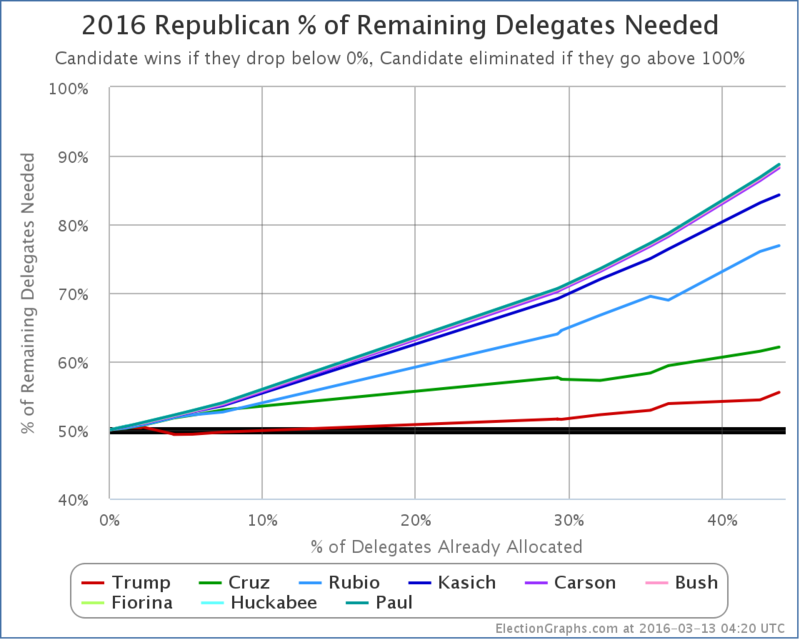 If the estimates above based on national polling are right, Trump gets all 40 delegates. 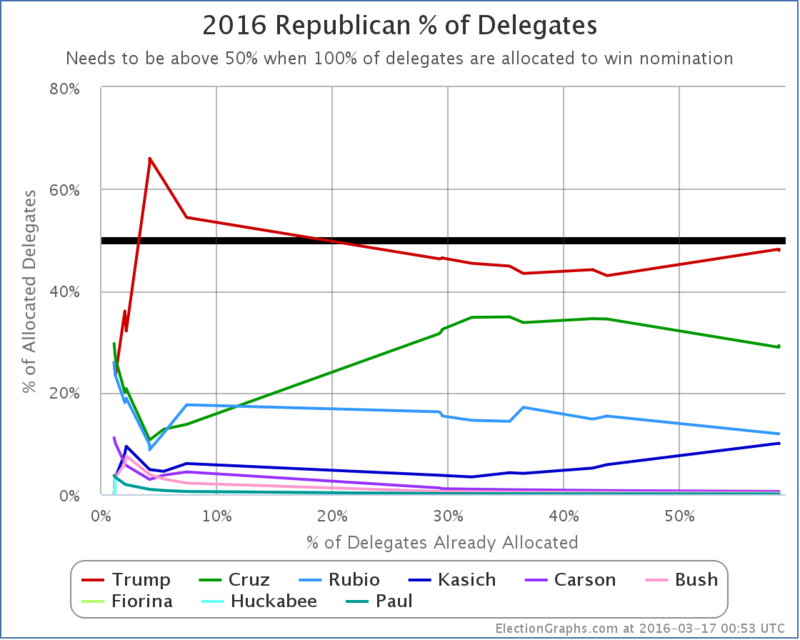 If he doesn’t hit 50%, but still gets a plurality, he is likely to still get almost all the delegates. We’ll estimate 40 to Trump. American Samoa might end up electing someone with a commitment, but the expectation given their rules is that all delegates will be uncommitted, so they will just stay TBD in my counts. Now, either Arizona or Utah COULD go in a completely different direction. As I said, there has been no recent polling. So who really knows? But if Trump ends up winning both, he will likely get something close to 98 delegates out of the two states. That would give Trump 51.20% of the delegates. He would once again have a majority of the delegates. Trump would then need 446 delegates to win outright. There would be 927 delegates left undetermined at that point. So Trump would only need 48.11% of the remaining delegates to win. Which given his history at that point seems quite reachable. But continuing to block him might still be within reach. Cruz + Kasich would only need to manage about 52% of the delegates. Which might be possible if they could build on anti-Trump sentiment even in the face of Trump winning. If they can do that is a big open question though. The “I can’t win, and you might not even like me, but vote for me to block the other guy and cause a contested convention where the outcome is completely unknown” case may not be the easiest one to make. But if Cruz and Kasich can make that case, then it is not over yet. So then we start looking at North Dakota, Wisconsin, Colorado… and beyond. Of course, if Trump loses Arizona or Utah, that all changes. So we will have to wait and see… but if I had to put odds on it, I’m still thinking about an 80% chance that Trump just wins this outright. The structure of the contests themselves are designed to help the front runner, and that is Trump. This by the way is much worse for Trump than the model in my last post predicted, since it used national polls in the absence of actual polls for these three places. There were also 9 “uncommitted” delegates selected yesterday. These people essentially become like the Democratic superdelegates, in that they are free agents at the convention. If I find out their preferences, I’ll assign them to the candidate they support, but for now they remain TBD. With all the contests so far there are actually 22 of these now. It will be interesting to see if they make a difference. In any case, with only 1 of 30 delegates from Saturday, or 3.33%, Trump fell very far short of the 54.39% of the delegates he needed to be on the path to an outright win instead of a contested convention. Trump now needs 55.49% of the remaining delegates to win outright. This number is getting high. And the gap between what Trump has done so far (42.96% of delegates) is getting larger. Nobody else got what they needed either of course, so everybody’s numbers got worse, not just Trump’s. Of course, we still have some big winner take all and winner take most states coming up, so time to refresh the poll based predictions for Tuesday and see what they look like now. 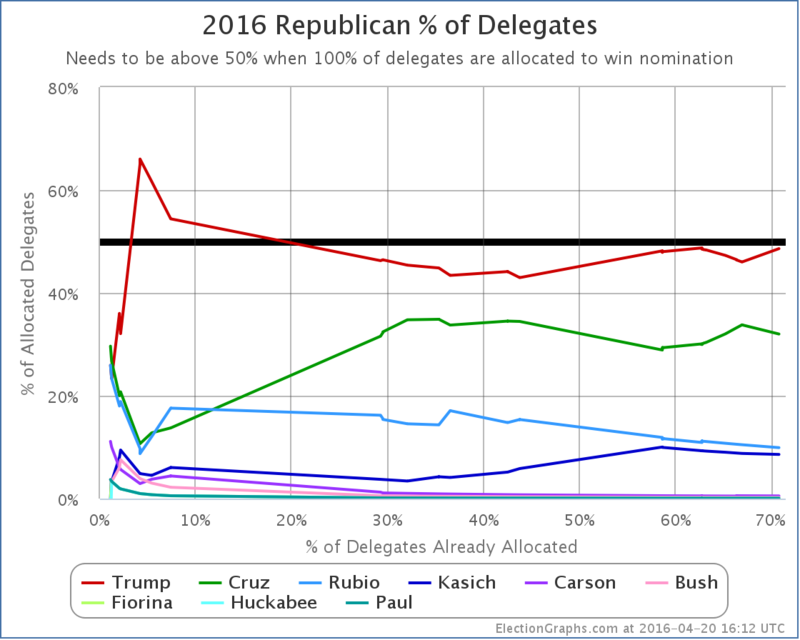 As usual, using RCP poll averages and delegate distribution rules from Green Papers. The main difference from the estimate a few days ago is that now Kasich is ahead in Ohio, and wins the 66 delegates there. This makes a big difference. Trump would get 61.6% of the delegates on Tuesday. Which even without Ohio would be above the 55.49% he needs to be tracking toward a clean win. Trump would have 47.7% of the delegates. Still not a majority. When you do all the math at the end of all that, Trump would need 53.37% of the remaining delegates to cleanly win a majority of the delegates. That would still be a substantial improvement from what he had been doing so far. But there would be more winner take all states coming up. And Cruz, Rubio and Kasich would be so far behind that the scenarios where they would catch up would be extremely far fetched. None of them can win outright. At best they can block Trump. Do all three of them stay in? Do their donors continue to support them in a bid where the only real goal is a contested convention? Can they really keep blocking him from getting a majority of the delegates through a long slog from now until June 7th? The “Trump wins Florida, but loses Ohio” scenario is the one where it would be premature to say either “Trump will win this outright”, or “Contested Convention”. Instead, we’ll still be hovering between those possibilities, waiting for more states to weigh in. This might go on awhile. Finally, as I did with the Democrats earlier, a quick look back, comparing Trump today with Romney in 2012 and McCain in 2008. 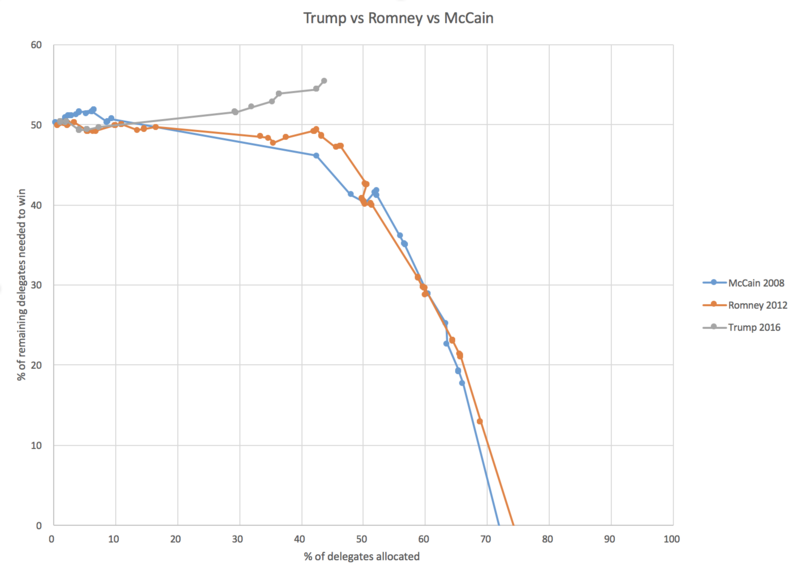 You can see that at this point in the race, both Romney and McCain needed less than 50% of the remaining delegates to win. Trump is way behind that pace. 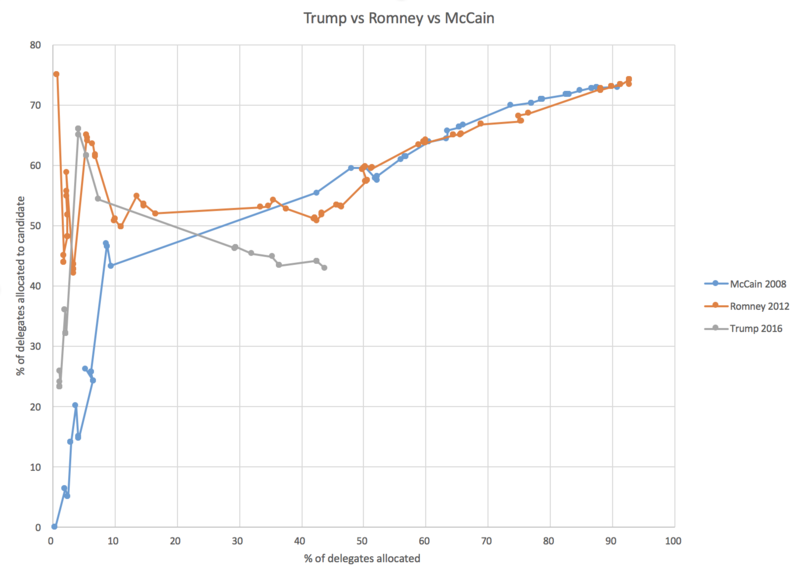 But it was also not until right around now in the races that McCain and Romney really started to pull away. Trump has a harder road here, but with a handful of big winner take all states it is not too late for him to start a downward dive to a flat out win. But if his line doesn’t manage a full on turn downward, eventually it will curve up, and we’ll end up at the contested convention. Despite his wins, Trump considerably underperformed what his polling indicated just a couple days beforehand, while Cruz beat his estimates by quite a bit. Rubio, well, Rubio just flamed out. Now, this is still a Trump win, but the fact that it was less than the polls would have predicted may mean that there is weakness in Trump that is not being captured by the latest polls. Also, it was not enough to put him on track to get back out of the “contested zone” where we are on track for a contested convention, and back to a place where he actually has a majority of the delegates. 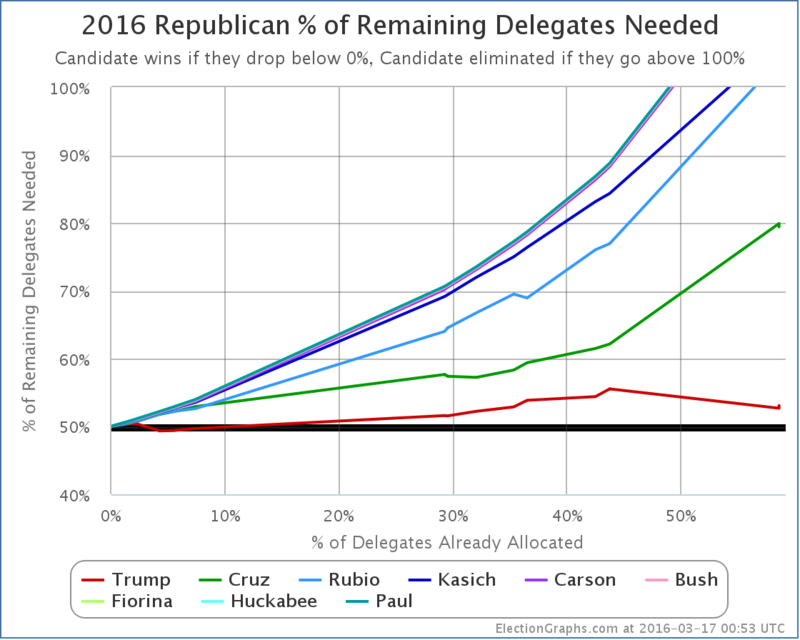 Before today, Trump needed 53.85% of the delegates to be on track for an outright win. For the night he got 48.67% of the delegates. Not quite there. So his % needed for the next contests increases to 54.39%. This is getting high given that his history to date is only getting 44.14% of the delegates. He needs to improve his rate of delegate acquisition by about 23% to head toward an outright win. If the remaining states were all straight proportional, it might already be time to start saying the likelyhood of the contested convention was getting to the point that anything else would be a surprise. But the Republican contests are almost all biased at least a little bit to the winner, and starting March 15th, we have a number of high delegate winner take all states, most notably Florida and Ohio. As I’ve been doing, lets look at the next few contests. This time lets go all the way through the big March 15th day. 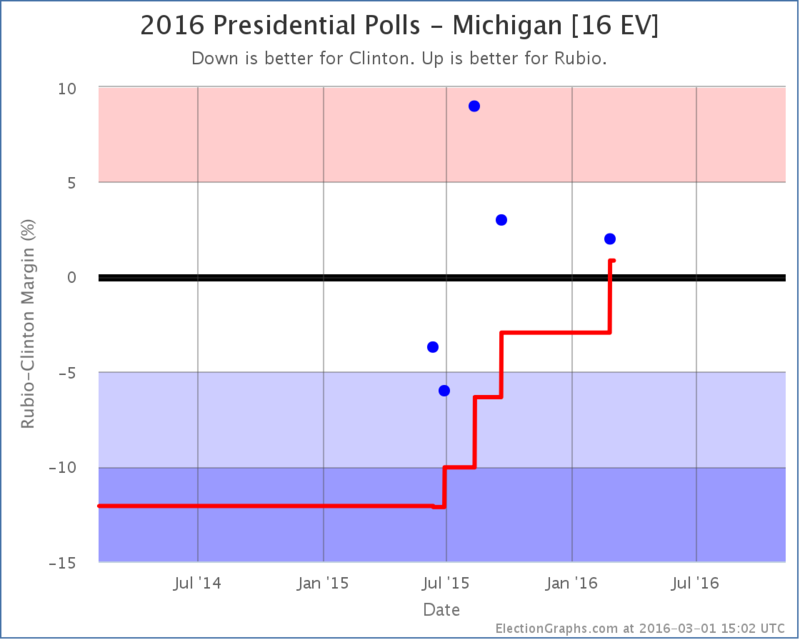 As usual, using RCP poll averages and delegate distribution rules from Green Papers. That would give Trump a whopping 74.36% of the delegates, well above the 54.39% he needs. Now, because that includes some big winner take all, and some more that are winner-take-most, that is highly volatile. If he loses Florida… or Ohio, where the race is a lot closer… then things start to look worse for Trump very quickly. 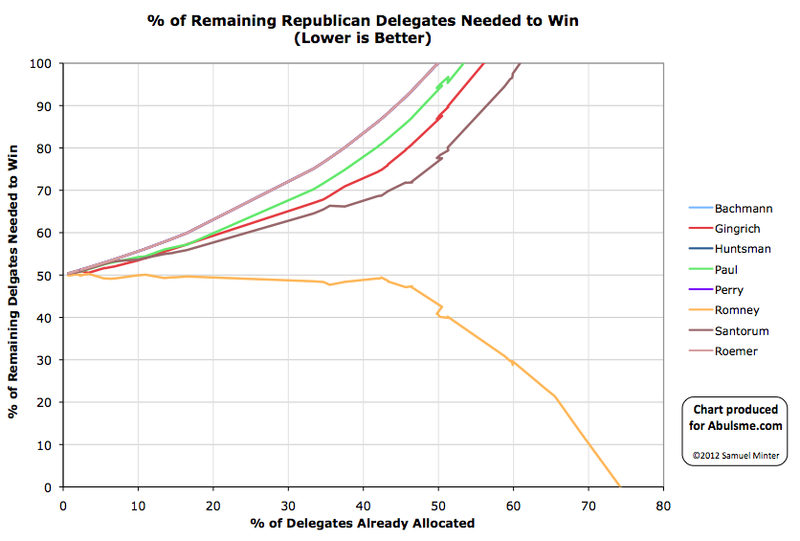 In terms of winning outright… not necessarily in terms of keeping the delegate lead. But given the results above, does Trump get back to a delegate majority? Trump would have 52.97% of the delegates. He would be back on track for an outright win. Not only that, but 1482 of the 2472 delegates would already have been allocated. That is just a hair under 60%. Only 990 delegates would be left. And Trump would already have 785 of the 1237 delegates he would need to win outright. So he would only need 452 more delegates… or 45.66% of the remaining delegates. Which would probably be an easy ask given where the campaign would be at that point and the number of winner take all and/or winner take most states coming up. If he wins both states, the chances of a contested convention drop dramatically. We’re almost certainly looking at a clean Trump win. Take away Ohio and Trump would no longer have a majority at this stage, and would still need 52.32% of the remaining delegates to win outright. This would still be very doable, just a little bit harder. In this scenario, we might be hanging on the edge between the contested convention and the Trump win for awhile. Take away Ohio AND Florida and not only would Trump not have a majority, but he would need a full 62.32% of the remaining vote to win outright. This number would be more difficult to achieve, and the chances of a contested convention would then be very very high. Now, this of course assumes the results are somewhat similar to the projections above in the other states too… but the general outlines of this are likely to remain true. Where we are after March 15th will depend in huge part on Florida and Ohio. Right now Trump is way ahead in Florida, and has a slim lead in Ohio. 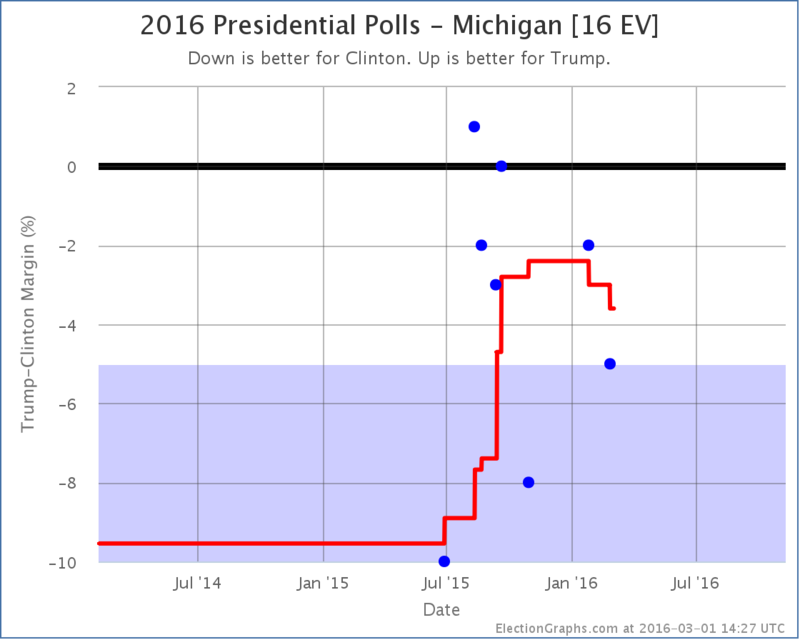 But Trump has been underperforming his polls lately. If that trend continues, things may be closer than they look right now. There are five and a fraction days left, including one more debate. So there is room for considerable movement as well. But Trump has a significant advantage at this point. We are currently in the “contested convention” zone… but Trump is in a very good position to knock us out of there and into the “Trump wins” zone. Republicans: Trump wins Super Tuesday. Is it too late to stop him? The Republican Super Tuesday is over with the exception of a handful of delegates that were still undetermined when it was time for me to start writing up the results. The 6 that are still to be determined as of this update are from Tennessee (3 delegates) and Texas (3 delegates), but they won’t make much of a difference here. The poll based estimates were not quite as close as they were for the Democrats. This may simply be because I did the estimates a full week out based on relatively sparse polling. There were a lot of polls in that last week, and it may well be that the results would have been closer if I had redone the analysis on Monday. The general outlines of the estimate and the analysis based on them were basically correct though. The one notable difference is that Rubio did considerably better than the estimates, at the expense of both Trump and Cruz’s delegate totals. 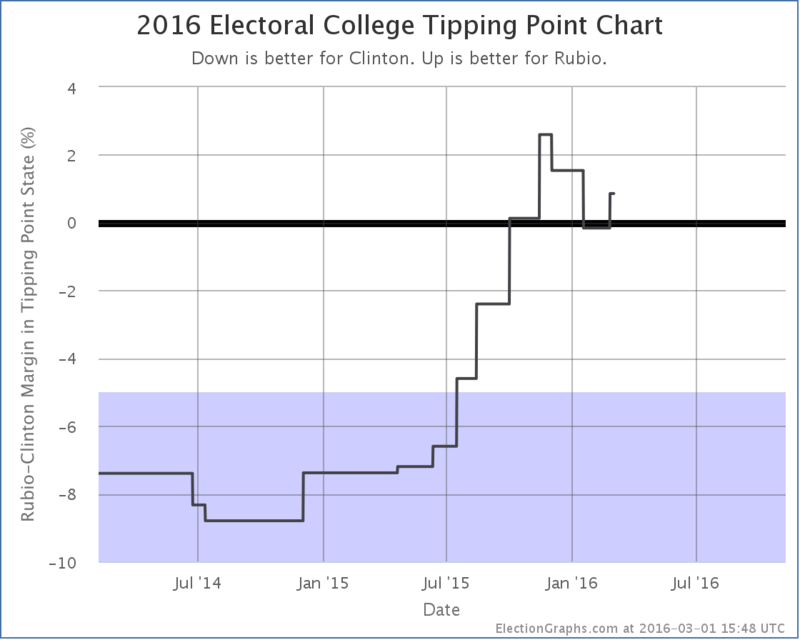 It appears that Rubio’s week of anti-Trump crusading may have worked. Trump needed to get 49.4% of the Super Tuesday delegates to improve his position in terms of getting to a clean first ballot win. Instead, he got 43.1% of the delegates so far. So his “% of remaining delegates to win” increased to 51.6%. We are back in the zone where if everybody performs the same as they have so far, we end up with Trump having more delegates than anybody else, but a bit short of the majority he would need to win. The “contested convention” scenario. At this point the closest competitor is Cruz, who would need 57.7% of the remaining delegates in order to catch up and win outright. Next closest is Rubio, who would need 64.0% of the remaining delegates. Given their past performances, it seems unlikely that either will reach anything close to those numbers, especially since they both seem determined to stay in the race. It would take one of them dropping out AND a complete Trump collapse to enable that. This seems like an unlikely scenario at this point. But both the Cruz and Rubio campaigns are now starting to openly talk about a contested convention. To do that, neither Cruz or Rubio need to get super-majorities of the remaining delegates. They don’t even need to get majorities. They don’t even need to have a majority of the delegates between them. They just need to keep Trump to less than 51.6% of the remaining delegates. So Cruz + Rubio + Kasich (now that Carson has dropped out) just need to manage to get 48.4% of the remaining delegates between them. And if they successfully do that, they will need even less the next time around. At this point, the best strategy to “stop Trump” is not for more people to drop out. It is for all three of the remaining non-Trumps to stay in to try to get as many delegates as they can, even if they know they can’t get to an outright win either. Strategies have been suggested such as the candidates working together and encouraging their supporters to vote for whichever non-Trump was strongest in each state in order to maximize the delegate totals. Then they would work it out at the convention. That kind of coordination between rival campaigns is unlikely. But it could happen to some degree spontaneously between now and March 15th, just by the nature of having four candidates still in the race. Even though Trump is leading in a lot of the states in the next couple of weeks, it is possible the non-Trumps could keep him below that 51.6% target, and thus be on the road to a contested convention. But… starting March 15th there are winner take all states. Not just states where the delegate totals are heavily weighted to the winner, but pure unadulterated winner take all. 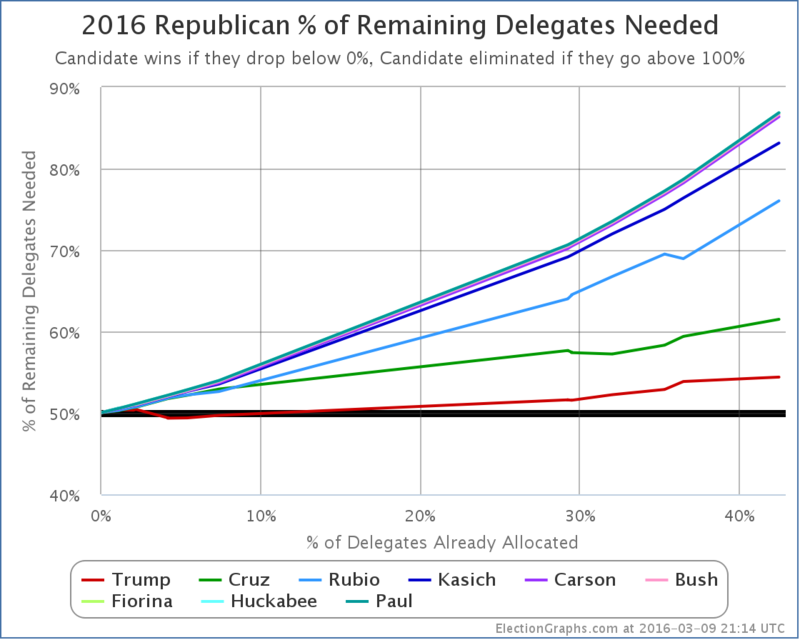 If Trump is below 50% of delegates at that point, but not by all that much, and he is still leading the polls, then starting on March 15th, he’ll just start cleaning up and get back over 50% very rapidly, and then close out the contest. In order to actually force a contested convention, the non-Trumps not only have to keep him below 51.6% of the delegates that are being doled out in the next couple weeks, they either have to keep him MUCH lower than that number in the next two weeks, or they have to damage him so much that by March 15th he is losing states left and right and the others can continue to pick up large numbers of delegates in the winner take all zone. Of course, the two might have to come together. The odds of a non-Trump winning the nomination outright are now negligible absent a major event that destroys Trump’s prospects. The ability to deny Trump a majority is still alive though. But the time for even that is running out quickly. The non-Trumps basically have two weeks. Of course, Trump might still come out of a contested convention as the nominee, especially if he came in with a plurality of the delegates that wasn’t very far from the 50% mark. But all kinds of things can happen at a contested convention, including the emergence of a nominee who wasn’t even running. You never know. One final thing before closing up. I have heard a lot of commentary saying that if any other candidate besides Trump was in the position he is in, he would already be being called the presumptive nominee. Maybe. But we really aren’t quite there yet. We are currently at the point where about 29% of the delegates have been allocated. Super Tuesday was bigger in 2008, so we don’t have a data point between about 10% and 42%, but you can see that in that Super Tuesday event, McCain took a clear lead, leaving all of the competitors behind. Although things were still a muddle before Super Tuesday, from that point forward there was no stopping McCain. His dominance was unmistakeable. In 2012, Romney was over 50% of delegates earned almost from the very beginning. He continued to hover just below 50% of remaining delegates needed to win though, leading for continued talk of a possible brokered convention for awhile longer. It took until we got past 45% of delegates for Romney to really pull away and eliminate that possibility, making it a clean win. 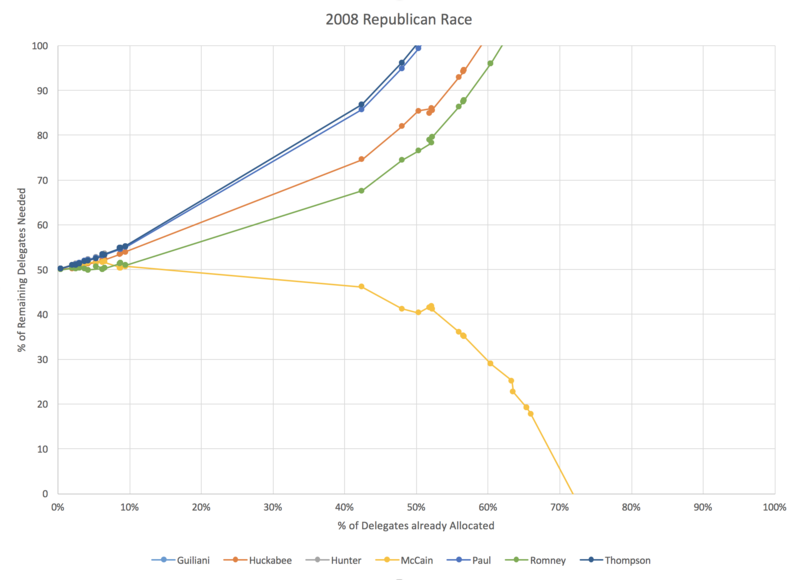 2012 is probably the closest parallel to where we are today, but Romney never dropped below 50% of delegates after that first few percent at the beginning of the race. Trump is weaker than that at the moment… and his opponents are stronger. But the gap isn’t large. He trails Romney, but not by much. We’re going to go from just under 30% of delegates determined today, to just under 60% after March 15th. Things will move very quickly, and if there really is going to be a good chance of a contested convention, the groundwork will be laid in these two weeks. If the non-Trumps want to stop Trump, that almost certainly needs to be the game plan at this point. And it has to start bearing fruit NOW.